We are your premier antique and collectibles store in North Florida. Contact us today (850) 577-1045. 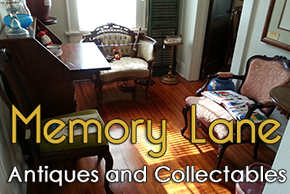 Memory Lane Antiques and Collectables is one of the premier antique stores in North Florida. When you're out treasure hunting, antiquing, or simply trying to find that distinctive, one-of-a-kind gift, come visit our showroom for a dazzling display of beautiful artwork and antique wares. Memory Lane has scoured the country for the best furniture, housewares, and artwork. We offer only the highest quality antiques. We make your antiquing easy. •	Quality Antiques—From rocking chairs to lamps to children's desks, our collection of antiques is incomparable. We carry hard-to-find antiques from the 18th, 19th, and 20th centuries. •	Collectables—Find the perfect knickknack for your mantelpiece. From stunning European glasswork to delicate pottery to sterling, we have collectables that will match any décor and lifestyle. •	Vintage Items—Search for that rare, kitschy, mid-20th century item. Relive your childhood with vintage finds from your youth. Or find that perfect retro dress or top hat. We carry collectables for every budget. You will feel like you're wandering through a fine art museum. Only it'll be better, because our precious artwork is not just for gazing. If something catches your eye, you can take that treasure home with you. And every purchase comes with a story. We tell you that story on each and every item: all merchandise has a label that describes the details of the item; where it's from, its age, its condition, rarity, and all the other features that make that purchase unique. Not sure if the blue crystal vase or the bronze horse works better on your end table? Our knowledgeable sales staff will be eager to discuss all the delectable treasures that are everywhere, and help you choose the perfect antique for you. Come visit our store in Tallahassee or call us today to see what rare jewels of the past you can unearth.